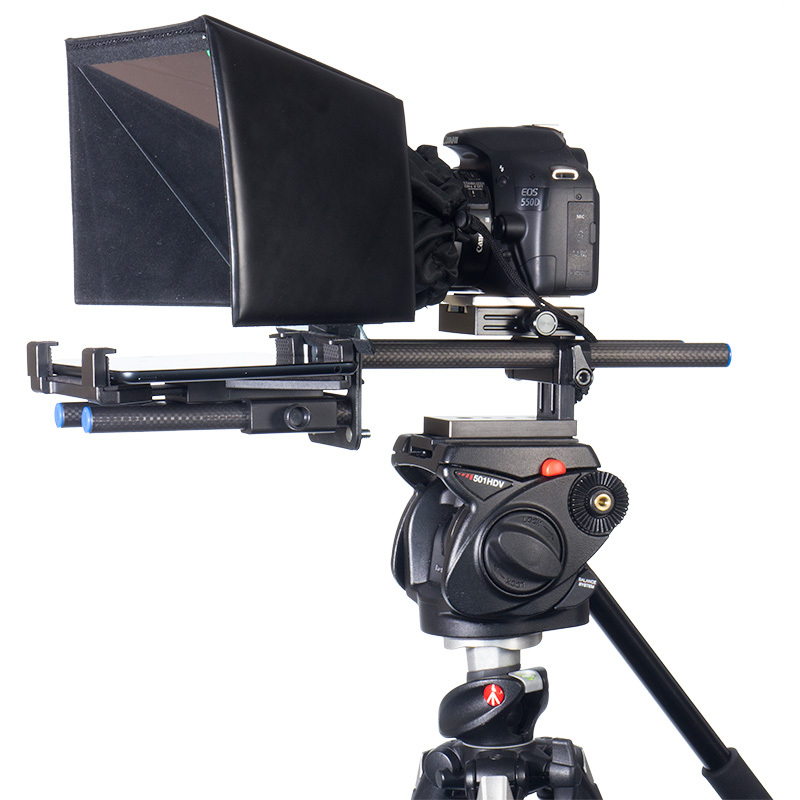 With Datavideo, the process is simple: load the free DV prompter app, insert the tablet into the rig and control the text with a controller. 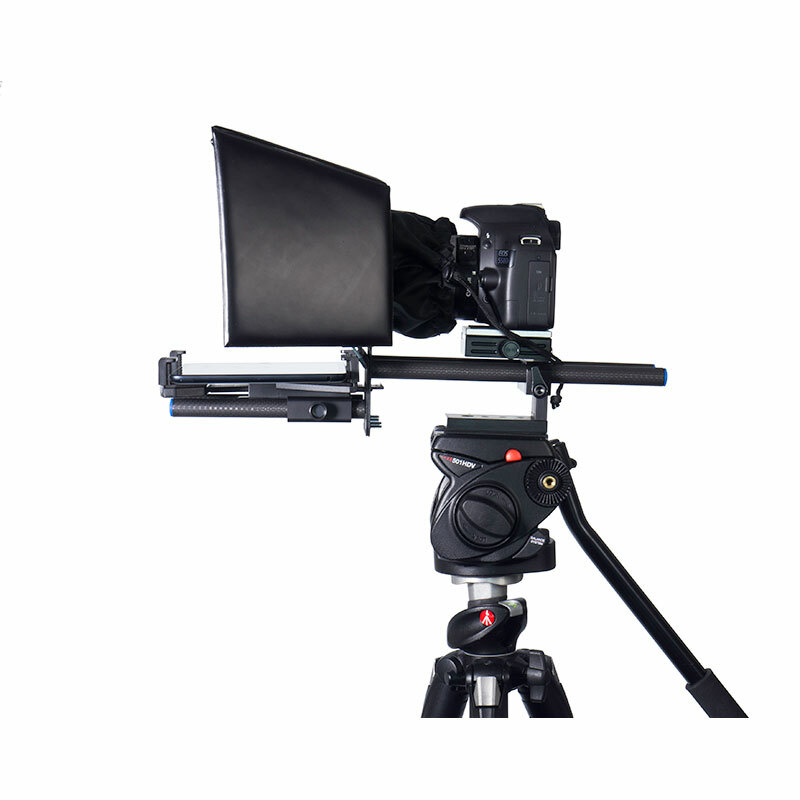 For a wireless and centralized prompting solution, Datavideo prompters are compatible with the DVP-100. 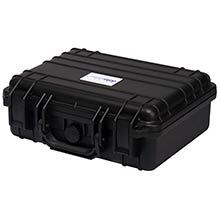 Hard carrying case for Monitors / Cameras / TP-500 Teleprompter / Accessories etc. 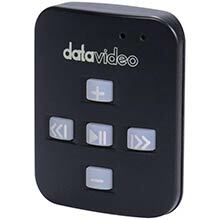 Why does my DV Prompter remote not work after updating my iPhone/iPad to iOS7? 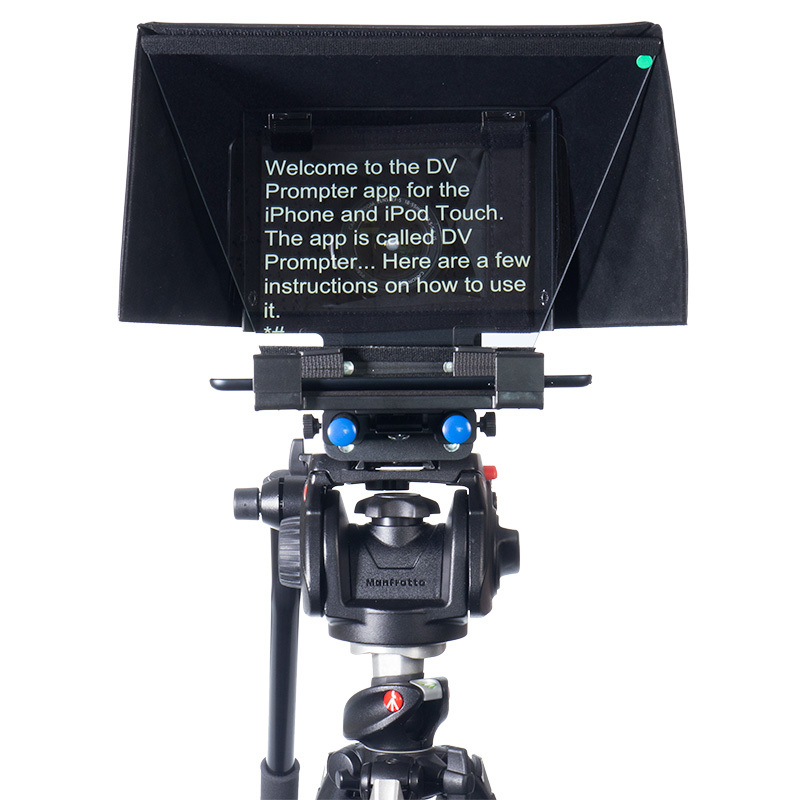 With iOS 7 you need to allow DV Prompter to access your microphone in order for the wired remote controller to function. I recently updated my Apple device to iOS 7 and now my remote no longer works. Is there anything I can do? After updating your Apple Device to iOS 7 you may be asked a question about permission for the App to use the mic and Bluetooth connections. Please allow these permissions otherwise the remote may not work. If the wrong option was chosen then these features can be turned back on by going into General Settings on the Apple device. 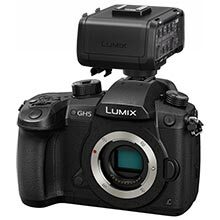 My remote has paired successfully with my tablet device over Bluetooth but I still have no control over the script when using the DV Prompter App. Is there something I am doing wrong? Check you are using the latest version of the DV Prompter App. If in doubt delete the App from the device, then download it again from the Apple App store or Google Play. The DV Prompter App Settings are important too. The Remote setting should be changed to Bluetooth before attempting to control the script scrolling etc. Try the above steps before contacting your supplier. My Bluetooth remote has charged fully but does not pair with my cell phone or tablet. Is there something I am doing wrong? Is the remote fully charged? If yes, try resetting the Bluetooth Remote next. To do this press and hold down the green play button until the LED glows red. Then try pairing the device and remote again. Still not working? Clear, or delete, any items already in the tablet or cell phone’s Bluetooth list. On Apple iOS devices there is an arrow right icon next to each Bluetooth item previously connected. Tap on the arrow then use the remove or forget option. Android devices act in almost the same way with a settings icon instead. On Android devices the option may be unpair or delete. Once all previous Bluetooth items have been removed from the list then try pairing the device with the Bluetooth remote again. Try the above steps before contacting your supplier. My Bluetooth remote does not seem to be charging and the LED does not light at all when connected to my computer. Is there something I am doing wrong? The LED light on the Bluetooth remote should flash red whilst charging with a computer. Make sure the computer is switched on during the charging process. Check the supplied USB cable for damage. If damaged try a different USB cable. Connect the USB charging cable to a different USB port on the computer, or try with a different computer. Still not flashing? The remote needs to be switched on. Press the green play button on the remote whilst it is still connected to the computer USB port. Still not working? The charge in the battery may be very low or empty. Leave the remote connected to the computer and try switching it on again after 15 minutes. 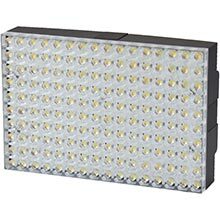 Try the above steps twice before contacting your supplier. Do not open the remote or attempt to replace the rechargeable battery as you will invalidate your warranty. 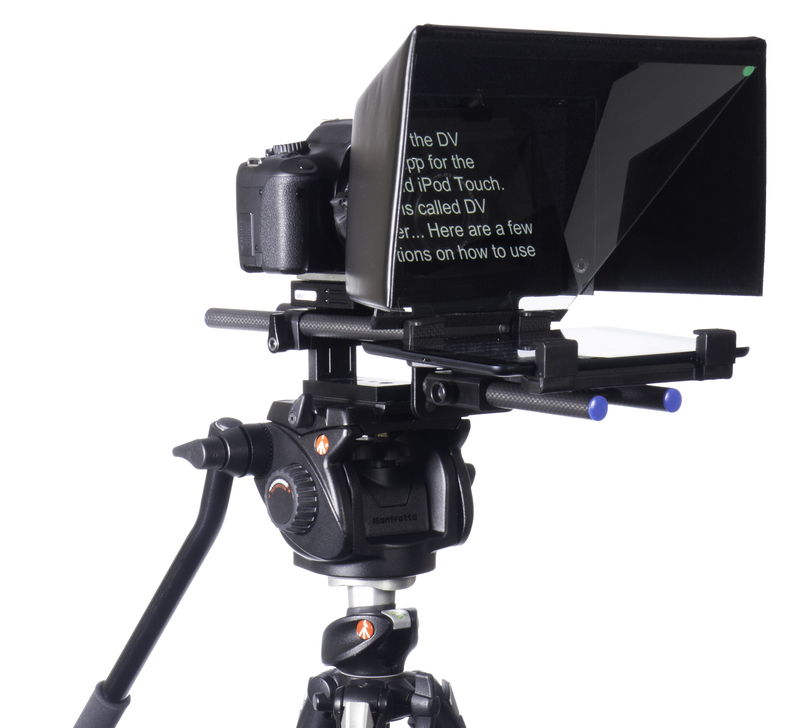 Datavideo has introduced two new prompting systems to complete its line-up of teleprompters. Like earlier systems, the TP-500 and TP-600 are designed around Apple iPad and Google’s Android tablets, to deliver a cost-effective and versatile solution. 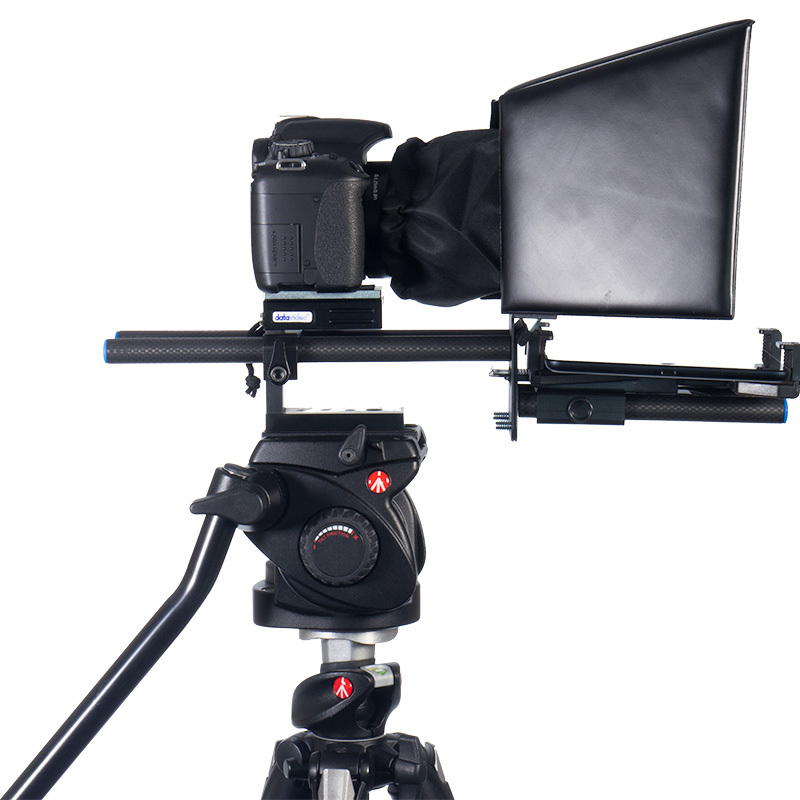 Each teleprompter is controlled by the presenter via a wired or wireless remote. 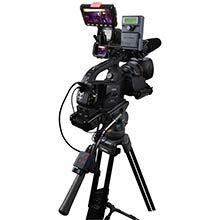 However, twinned with mini WiFi encoders, multiple teleprompters can even be controlled from the production desk.